The Saudi Arabian retail banking market showed a strong growth in 2017. Revenues increased 8.5%, up to SAR 39 billion representing 45% of total banking revenues, with the support of high demand for consumer loans and credit card, driven by the expansion in population and the products of personal loans. Al-Rajhi and NCB possessed 51% of sector revenues with a market share of 30% and 21%, respectively, yet their retail sector revenues accounted 74% and 45% of each bank revenues. The profits of the retail banking surged by 25%, coming in at SAR 16.74 billion, which represented 37% of the banking profits. The sector has witnessed a major variation in terms of performance of the banks, as Al-Rajhi bank possessed nearly 36% of the segment net profit, followed by NCB which accounted for 24%, meanwhile 10 banks shared the remaining profits. 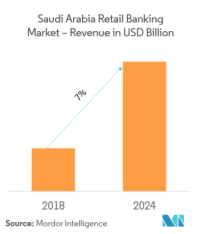 A complete background analysis of the Saudi Arabian retail banking market is covered in the report, which includes an assessment of the parental market, emerging trends by segments and regional markets, significant changes in market dynamics and market overview. 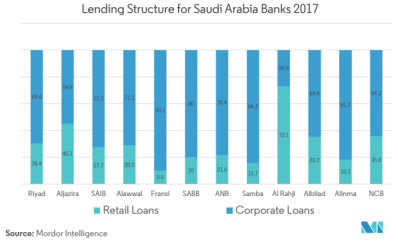 Al-Rajhi Bank is the highest retail loans provider with 35.8%, and Banque Saudi Fransi is the lowest retail loans provider with 9.9%. The banks in Saudi Arabia have a huge opportunity to develop ways to engage their retail customers on a digital basis. According to Bain & Company’s survey of 152,000 bank consumers in 29 countries, of which more than 1,900 customers were in Saudi Arabia. The survey results stated that 72% of the Saudi Arabian customers interact with their banks digitally, but this group is much higher in other countries. 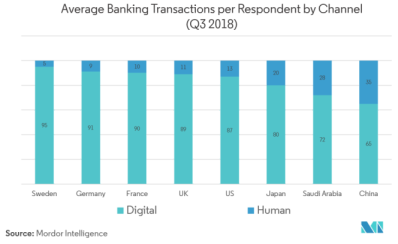 Among all the countries, Saudi Arabia has one of the lowest shares of digital first customers (those who perform more than half of their banking online or via mobile devices). These customers are significantly more loyal to their banks than traditional channel users. As with their counterparts in other countries, Saudi banks face stiff completion from tech companies that offer financial services. Already, 53% of Saudi Arabian bank customers use a third-party online payment solution, and 72% said they trust at least one technology company more than banks in general. Earning customer loyalty is an important challenge for Saudi banks. The report covers major international players operating in Saudi Arabian retail banking market. In terms of market share, few of the major players currently dominate the market. 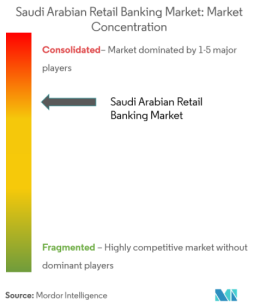 However, with technological advancement and product innovation, mid-size to smaller companies are increasing their market presence by securing new contracts and by tapping new markets.